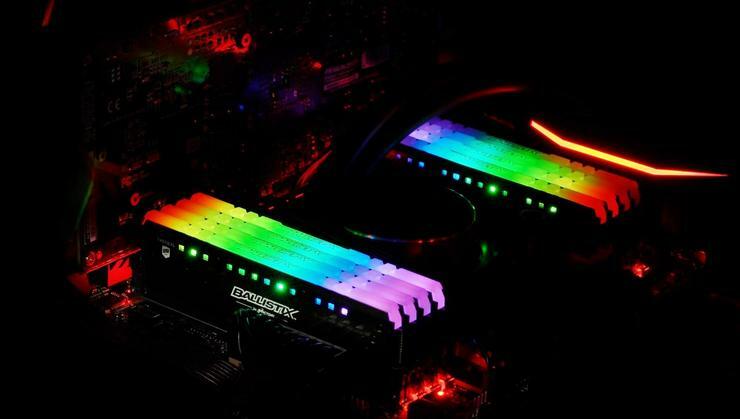 Ballistix has announced the availability of Ballistix Tactical Tracer RGB DDR4 memory. The new Tactical Tracer RGB modules, available in 8GB and 16GB densities with speeds up to 3000 MT/s, allow gamers to light up their systems with 16 RGB LEDs in 8 zones on each module. PC modders will be able to customise their system’s look by removing the Ballistix-labeled light bar for maximum brightness, or 3D printing their own light bar to truly leave their mark on their memory. “A lot of the members in our community love to personalise their gaming rigs and the new Tactical Tracer RGB DDR4 modules help achieve just the style they are looking for,” said Jim Jardine, Director of DRAM Product Marketing. Tactical Tracer RGB modules also work with the Ballistix M.O.D. Utility – software that’s designed exclusively for Ballistix modules. Gamers can use the M.O.D. Utility to monitor memory temperatures in real time, adjust Tactical Tracer RGB LED colour schemes and brightness, turn the lights on and off, and switch up display patterns. Ballistix also say that PC modders will be able to use their motherboard’s software to sync Tactical Tracer RGB LEDs with the other components in their rig. In addition to increasing personalisation, users get all the features of the Ballistix Tactical series including XMP profiles, stylish black PCB, and custom heat spreaders. The Ballistix Tactical Tracer RGB DDR4 modules are available to purchase at crucial.com and through select global partners. All Ballistix memory is backed by a limited lifetime warranty.